In a striking new interpretation of film noir, Thomas Hibbs mines the philosophy and theology of these dark films to reveal a subtle but profound insistence on the reality of redemption. Properly understood, these tales of spiritual quest assume a new importance amid the nihilism of contemporary popular culture. Repudiating old-fashioned American optimism but never quite succumbing to despair, noir depicts a world of captivating characters who, in the words of Pascal, seek with groans. Often denounced as nihilistic and even degenerate, film noir seems an unlikely antidote to the hopelessness and banality of modern popular culture, which Hibbs analyzed in his landmark book Shows About Nothing. Yet beginning with films of the classic noir period and continuing with more recent neo-noir and beyond, Hibbs reveals a theme of hard-won, penitential redemption. Despite its roots in the heyday of Hollywood Marxism, noir even displays a deeply conservative bent redemption is personal not political, and the progressive promise of scientific rationalism is sharply limited. Hibbs s ability to expose a film s philosophical underpinnings gives his analysis a compelling depth. 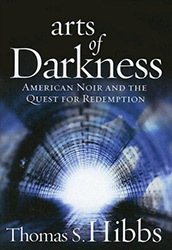 His master stroke in Arts of Darkness is to approach noir through the thought of Blaise Pascal, the 17th-century philosopher of the hidden God whose tragic account of the human condition anticipates the alienation of contemporary culture and explains the power of noir s overlooked religious themes of quest and redemption. The subject matter of Arts of Darkness what Hibbs calls American noir is expansive. It includes not only the familiar shadowy works of the 1940s and 50s but also many recent films in which Hibbs detects a convergence of noir and the religious quest.